What originally started as a guest feature for Tantu's debut release "Language of Beats," spawned into a project of its own titled "The Soulution." 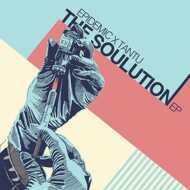 A short but sweet display of Tantu's diverse pallet of sounds and Epidemic's ability to subtly adapt to a producer's style. This project brings a refreshingly modern sound while keeping relative familiarity with the golden era-esque vibe that Epidemic has been known to bring. It features a soulful sound scape with melodies ranging from both uplifting to nostalgic all packed into about 25 minutes. Entirely produced by Tantu, with 5 songs, one instrumental and 2 of the west coast's finest lyricists (The EP features Fashawn and Johaz of Dag Savage), it is something like quick a shot of dope - sure to hold fans over until the next full length release.